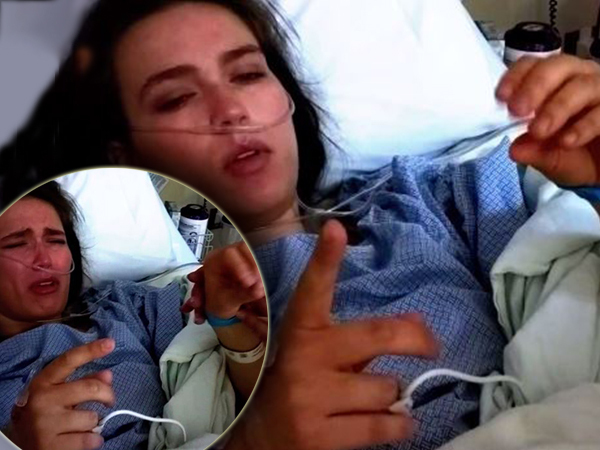 A young woman in Utah, USA awoke from surgery in a post-operation daze and played a riveting game of Pac-Man using only her hands. Jenn Packham’s (22) joystick-less reenactment of the arcade game was quite suspense-filled and didn’t end very well for Pac-man. The clip was apparently filmed after Jenn’s leg surgery in a Salt Lake City hospital earlier this month. She started out thinking her left hand was Pac-Man and she started to move him through an imaginary maze – complete with the games sound effects. But things became a tad emotional for Jenn when she realized a ghost (aka her right hand) was about to devour Pac-Man and he had nowhere to move. Unsure of what to do and seemingly terrified of the ghost closing in on Pac-man, Jenn sobs; "Oh man this is a bad idea, I don't know where to go." The unidentified cameraman then zooms in on her as her enjoyable game starts to go sour. An unidentified woman in the room then tries to comfort Jenn by offering her an alternative move for Pac-Man. "Oh, dear, he’s going to turn this way, that’s all,' suggests the woman to a hapless Jenn. Despite a valiant effort to flee from the ghost things don’t end well for Jenn’s Pac-Man and she subsequently throws her head into the pillow and cries in frustration.